In an abandoned warehouse a gangster band is splitting its loot, but they can`t get an agreement on the split! It`s time to let the guns talk and soon everyone is aiming at everyone. The richest surviving gangster wins the game! 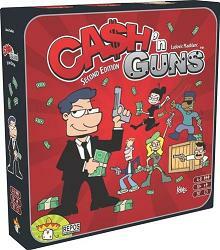 Ca$h `n Gun$ will make you relive the best scenes of your favorite gangster movies. Fun, bluffing, and tough negotiations are guaranteed, but will you dare to play? It`s simply killing! On each turn, a player will assume the role of "The Don", and will call out the steps in gameplay. After that, the "Don" of the round will ask the players, including himself, to load their guns (in the form of selecting one of three possible cards: "Bang! ", "Bang! Bang! Bang!" or "Click! Click!" from a set of 8 cards: 2 "Bang! "s, 1 Triple-"Bang!" and 5 "Clicks! "), and then count down to all of the players aiming their guns (real foam guns). Each player will then take a look at how many guns are pointed at them, and also take a look at the available pot of cash for the round before deciding if they want to "Chicken Out" and remove themselves from the skirmish. If they choose to back down, they will get a "Chicken" token which will deduct from their ill-gotten gains at the end of the game. But all players have to "Chicken Out" at the same time, using a countdown like the aiming. The remaining players will resolve the shootout showing their cards. First, all Triple-"Bangs!" wound the players they are aimed at. If there are still-aiming players with "Bang!" cards, those now wound their targets. "Click! "s are only bluffs and do nothing. A player that is wounded during the standoff does not participate in the split of the cash and receives a bandage (any player that receives a certain number of bandages is eliminated from the game). Now all the used cards are discarded--even those of the players that "Chickened Out". The game is played 8 rounds, until all cards were played. Keeping track of the cards is important, since all players have only a limited supply of "real" shots.